About you by XXYYXX always reminds me of swimming under the water, it's the perfect relaxation song! This look's setting was a no-brainer for me, the dress's shimmering turquoise colour matching the cool aqua of my apartment block's pool. I love this dress that I picked up from Topshop in the Ibn Battuta Mall, it's not the usual style of dress that I go for but when I tried it on I fell in love with it. It's so fun and youthful, plus paired with bold coloured heels is the perfect outfit to wear out! It was a super-hot day today, perfect weather for a swim, so it was great to be around the pool. The lipstick I wore with this outfit is actually a stain by Mikyajy. 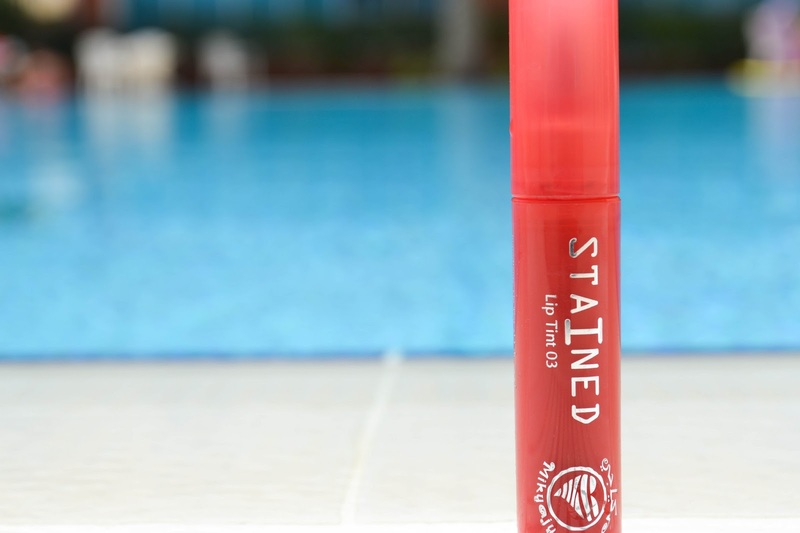 It's great because it stays on for much longer than your usual lip colours do, meaning longer lasting bold colour, perfect for the pool side. I'll do a review on the range soon, so keep posted for that. Quick Tip! - For long lasting lip colour, apply the first layer of lip gloss or lipstick onto your lips (preferably already prepared with a primer or foundation), apply evenly with the finger for best results. Dab the colour from the lips with a tissue to set the first coat, then apply a second layer on top (don't dab this time!). And there you go, long lasting, perfect colour. Let me know what you think! Thanks for reading!